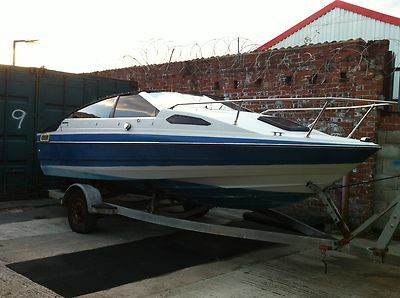 BAYLINER CUDDY CAPRI SPEED PROJECT FISHING BOAT WITH GALVANISED TRAILER. This boat was bought at the end of last summer. I was going to use the boat as a project over the winter and get it back into the water. Now summer has arrived and unfortuneately I’m no further on. I have heavy work commitments and just don’t seem to have the time. Therefore the boat is being sold as a project. This boat is a fantastic project that does not actually need a lot of work! I will list all the things both Positive and Negative in relation to the boat to the best of my knowledge for your information. POSITIVES COMPLETE OMC COBRA STERN DRIVE AND DRIVE COUPLINGS (ONLY ENGINE MISSING) HYDRAULIC STEERING Approximately 19ft hull which is in good solid condition, solid bodywork. Stainless steel all looks very good Cuddy all in mint condition great seating/sleeping area Outside seating all there and in good condition Good carpet throughout the boat Digital dash – all working to best of my knowledge Steering and accelerator all there Windows all original and in very good condition Also comes with original “Bayliner Tonneau Cover’ STERN Drive and Stainless Steel Propellor NEGATIVES Needs an engine (a cheaper option would be to put an outboard on the boat – and sell the STERN-drive unit and propellor 2nd hand/remanufactured omc cobra stern drives retail @ over £2200 WHICH MIGHT EVEN BUY OUTBOARD) Needs a battery Needs an air vent on one side. These are available in stainless steel for around 20.00 VERY NICE BOAT EASY PROJECT JUST THE ENGINE IS MISSING EVERYTHING ELSE IS THERE VIEWING RECOMENDED WITH THE ENGINE FITTED THESE BOATS ARE WORTH A SMALL FORTURE. I AM OPEN TO SENSIBLE OFFERS CASH ON COLLECTION WELCOME.